One of the most overlooked and dreaded jobs for home maintenance is cleaning your gutters. As arduous a task as it is, when you neglect to clean your gutters, you invite unwanted pests toward your home, which could spell out disaster for not just the structure, but yourself and your loved ones inside the home. How do My Gutters Get Clogged? Clogging is often due to branches hanging above your home resulting in twigs, leaves, and any other debris becoming trapped once it lands in your gutter. These unwanted items absorb collected water and create a blockage on your drainpipe. Over time this results in the water having nowhere to escape, and eventually, it pools, attracting mosquitos and several other insects. Mosquitoes are attracted to your gutters because the stagnant water acts as a perfect breeding ground for them. Unfortunately, this is dangerous since mosquitoes within your living space increase your chance of contracting diseases from them such as West Nile Virus. Furthermore, improper gutter maintenance runs the risk of termite infestation, in particular, the substantially worse Formosan subterranean termites. These termites are incredibly aggressive. An average colony can consume over 1,000 pounds of wood a year in contrast with more typical native termites which consume about seven pounds of wood annually. Formosan subterranean termites fly, and therefore do not depend on the ground for mobility, and the average colony can contain ten million termites or more. Both of these factors intensify the threat that they present. No one wants pests in their home, but luckily there are many ways to prevent infestation. A simple regular cleaning your gutters can help to avoid buildup of stagnant water, so mosquitoes are less inclined to breed there. Regarding termites, try to avoid moisture accumulation by aiming your downspouts away from the home to divert water from your home. Using ventilation to reduce humidity from your crawlspace helps dry out the soil and make it difficult for termites to enter. For all of your pest control needs, look no further than Heron Home & Outdoor. 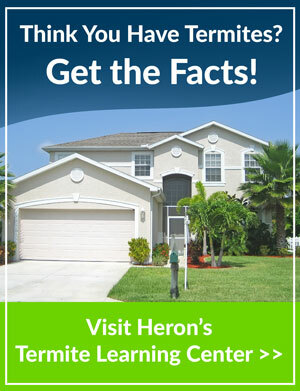 We off the Heron Guarantee of 100% Satisfaction so call us today at 1-877-772-0826 for your free same day inspection.